This Week: As we prepare for Music Month, next month we have a special prize pack for you. We’re looking for two winners. 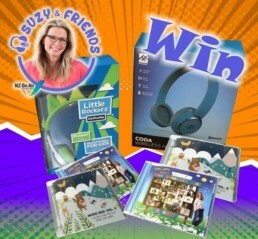 One will win a pair of iFrogs Little Rockerz headphones and the other will win a pair of Coda Wireless Headphones. Both come with a CD copy of the Totally Awesome Kiwi Kids Album. Each person should only enter once, to make it fair 🙂 . To Win: Hopefully you’ve used your taringa, your ears, this morning and you can tell us what whakarongo mai means. Give us your answer along with your name, age, address and telephone number to be in the draw to win.